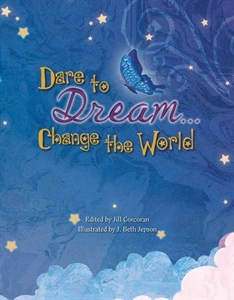 Do some of you remember the book called DARE TO DREAM . . . CHANGE THE WORLD? It was edited by Jill Corcoran and illustrated by J. Beth Jepson and published by Kane Miller EDC Publishing in 2012. The book has been named Winner of the 2013 Notable Books for a Global Society Award. The book features a number of people who have changed the world for the better, such as Jonas Salk, Temple Grandin, Martha Graham, and Steven Spielberg, and in each case two poets contributed poems about that person. I chose a boy named Nicholas Cobb, who made national news on Make a Difference Day with his work to raise money for other kids who needed coats and other help. I had the pleasure of being paired with Jane Yolen whose thought-provoking poem, “Under the Bridge,” reminds us that those homeless people we see struggling for life are not so different from us. Other poets in the book include Kelly Ramsdell, Janet Wong, J. Patrick Lewis, Laura Purdie Salas, curtis l. crisler, Tracie Vaughn Zimmer, Bruce Coville, Ellen Hopkins, elaine magliaro, Lisa Wheeler, Rebecca Kai Dotlich, Jacqui Robbins, Carol Tanzman, Julia Durango, Joyce Sidman, Lee Bennett Hopkins, Rose Horowitz, Alice Schertle, Hope Anita Smith, Marilyn Singer, Alan Katz, Denise Lewis Patrick, Hope Vestergaard, Georgia Heard, Joyce Lee Wong and Joan Bransfield Graham. REMINDER: For those who played IN OTHER WORDS, it’s time to post the quote that inspired you so others can see if they got it right. Thanks for playing and thanks to Matt Forrest and Renee LaTulippe for providing the idea. And here’s the note from Jill. AWARD WINNER! Dare to Dream … Change the World! has been selected as a winner for the 2013 Notable Books for a Global Society Award! This award is given by Children´s Literature and Reading Special Interest Group of the International Reading Association and is not only a tremendous honor, but also a significant factor in library collection decisions. My congratulations to Jill and all the other poets, including J. Patrick Lewis, Marilyn Singer, Joyce Sidman, Lee Bennett Hopkins, and Georgia Heard. Reviews will appear in “Dragon Lode,” a special interest journal published by International Reading Association. I wrote an article for that journal a while back. I invited Jill Corcoran to tell us about the free Common Core State Standards Curriculum Guide that is now available for the new book she edited: DARE TO DREAM…CHANGE THE WORLD. If you’re a teacher or librarian, or have friends who are, you’ll enjoy knowing about this! With the adoption and transition to the common core standards (http://www.corestandards.org), teachers across the country are going to be looking for new ways to cover these more detailed student learning objectives. This is an opportune time for authors to get their books in teachers’ hands, which equates to greater sales, more opportunities for speaking engagements, and longevity. Having a curriculum guide that accompanies your book sweetens the deal for most teachers. What is a curriculum guide? A solid curriculum guide includes all the necessary components for teaching a novel in an engaging way, while still reflecting the Common Core Standards. The most useful guides are those that are explicitly tied to the standards; pull out key, grade-appropriate vocabulary; offer a wide assortment of engaging activities for students to be involved in; contain thoughtful and spiraled discussion questions; and have at least one writing prompt. What’s most helpful to a teacher–who is juggling so much already–is to give them handouts and activities they can plug directly into their curriculum. Why is it important for an author? Teachers love teaching new novels, but any new work requires hours of preparation on the part of the teacher. A teacher has to divide up the reading of the chapters, create engaging chapter questions, uncover examples of various literary techniques, and develop at least one in depth, holistic assignment with a solid assessment. All of this work needs to reflect the standards (in most cases the Common Core Standards) and fit into a certain time period. Needless to say, teachers simply don’t have the time to teach new novels too often. How do I create one for my book? Starting in January 2013, the creators of my Curriculum Guide for DARE TO DREAM…CHANGE THE WORLD (http://daretodreamchangetheworld.com), Nicole Boylan and Erin Fry, will be posting a blog series right here on my blog where they will talk about the importance of the CCSS, and the basics of curriculum guides. You can check out some of their samples and model your guide after theirs. Or you can contact them and let them help you out. Nicole Boylan is a former teacher who came out of the classroom to pursue her passion for writing curriculum. Erin Fry has taught middle school for over a decade. She is currently both a teacher and a middle grade author (represented by Jill)–her debut novel, LOSING IT (http://www.amazon.com/Losing-Erin-Fry/dp/0761462201/ref=sr_1_3?s=books&ie=UTF8&qid=1353438873&sr=1-3&keywords=losing+it), came out in September and a second novel is due in 2013. They’ve both created standards-based curriculum and assessments for many years, working for companies such as Teachers’ Curriculum Institute and Aspire Schools. The adoption of the Common Core State Standards by all but five states has further ignited their passion to create engaging and meaningful curriculum. They are intimately familiar with the CCSS and have begun working with authors who wish to have standards-based curriculum guides for teachers to use in conjunction with their books. If you are an author who might be interested in having curriculum or discussion questions created for your book, they’d love to talk with you. Currently, they can be reached at commoncorespecialists@gmail.com. Nicole and Erin are working on Curriculum Guides for many of the most important kidlit authors writing today. For a free download of an example of one of their Curriculum Guides click HERE. (http://daretodreamchangetheworld.com). I always look forward to Mondays. Even when I have a week that I know will hold some difficult tasks or unpleasantries in it, Monday marks the beginning of another week of adventures. Today I plan to add to the list of ideas I’d like to write about. Before the day is up, my hope is to share some of the ideas on the list with an editor. About ten minutes ago I heard from a different editor who said she is passing for now on an idea I mentioned to her months ago. In the meantime I’d fallen out of love with that idea but it’s still on my list in a different genre. My congratulations to Jill Corcoran and Kane Miller Publishing for putting out a beautiful book: DARE TO DREAM . . . CHANGE THE WORLD. This is one I mentioned last week. My copy arrived on the weekend and I’m charmed by it. The subject I chose to write about is a young man in Texas, Nicholas Cobb, who began raising money to buy coats for poor children when he was ten years old. Nicholas is a hero and he’s a great fit for this book about people who have made a difference. For each subject in the book there are two poems. One is about the person, the second is a poem inspired by the first. In this case I wrote the poem about Nicholas and Jane Yolen wrote a poem inspired by that. For now the book is only available through the publisher, Kane Miller. Here’s the link to the book. http://new.myubam.com/search?q=dare+to+dream.